Download Manufacturing flash tool 6.0.51, Manufacturing flash tool 6.0.51 is an application for flash stock firmware, Flash file on your Intel dual OS based android and windows tablets, The latest setup for Manufacturing flash tool 6.0.51 has now released by Intel.inc.This latest setup Intel now fixed some bugs and fix some not working features. Download links are free, You can easily download the latest version of Manufacturing flash tool 6.0.51 easily on our website, The latest version of the manufacturing flash tool download for free, Manufacturing Flash tool is a free flash tool for Intel dual OS tablets, Here we are share the latest version of manufacturing flash tool 6.0.51 latest version for free download. Here below we are discuss some features about Manufacturing Flash tools. Manufacturing Flash tool 6.0.51 now comes with a pro installer applications, Now you can use use this tool very easily , Just simple download Manufacturing Flash tool 6.0.51 on your computer then just simple extract this tool on your computer using latest winrar or try 7zip and then try install the Manufacturing Flash tool 6.0.51_setup.exe file by – clicking Next-next-next-finish, Then Manufacturing Flash tool 6.0.51 is now ready to use. 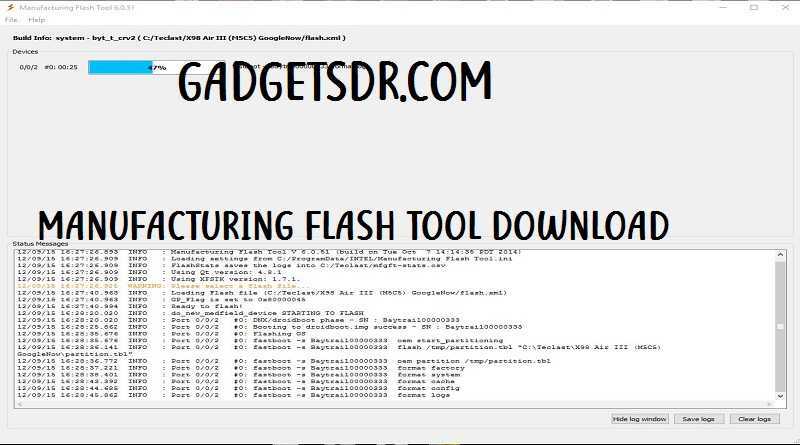 Manufacturing Flash tool 6.0.51 tool allows you to flash firmware on your Intel dual android and windows boot OS. Basically Manufacturing Flash tool 6.0.51 is little bit hard for when you using it for first time on your computer for flashing Intel dual OS supported tablets, because Manufacturing Flash tool 6.0.51 tool requires some experience before you using this tool, But don’t wary we are share detailed guide about how to use this tool for flashing Intel dual boot chipsets. Manufacturing Flash tool 6.0.51 tool allows you to see the progress or see the statistics of your flashing time, show detected driver COMPORT of your device,Number of tried to flash your Device with this tool, see the configurations settings of the tool, Numbered of successful flash, you need to enable this features on the Manufacturing Flash tool 6.0.51, to enable this select the Display Statistic button of your manufacturing flash tool. Manufacturing Flash tool 6.0.51 tools allows you to select and add the custom configurations, Manufacturing Flash tool 6.0.51 now include Detect test OS,Test OS PID. Test OS VID, Completed OS VID, Detect OS Completed, Check Battery Voltage, Settings Password, BYT Flash Mode, Fastboot CMD Sleep time and many more configurations. Bypass FRP Samsung A8 plus. Bypass Google account HTC Devices. Manufacturing Flash tool 6.0.51 tool is best with Intel USB Driver and Intel SOC USB driver. We already mention that Before you try to flash your device you need to complete all requirements, because if you do any wrong and skip any steps then your device might be boot-loop or bricked. Before you using Manufacturing Flash tool 6.0.51 tool, please take a backup your device data because if you flashing your device then your whole data will be erased and lost your all data. Download Manufacturing Flash tool 6.0.51 is created by Intel.Inc. So full thanks to them, So here we have shared this tool for free. Welcome to Gadgets Doctor Official website ..Gadgetsdr.com is the best website to download any Phones official stock firmware, combination file, Custom Rom, USB driver, Flash tools.W e are shared some files that have a password and are mostly all files password is GADGETSDOCTOR but is few cases we use this Password –GADGETS DOCTOR . Gadgetsdr.com always provides you all tested firmware and files all tools that help you to repair your Phones. We have always tested all the files and the firmware before we upload that on our Server. Please note we didn’t test all the tools that we share but that time we use the customer user reaction and feedback before we upload that files on our Website. if you like our file so please share this page with your friends on Social Media. We are updating our website is daily basics if you went to know latest firmware updates so join us our official Facebook page and also Follow us on Twitter and Youtube. If you get any problems so please contact us on Contact Us pages . on this page you found flash tools, mi unlock tools,FRP unlock tools,firmware without password, Samsung FRP unlock firmware, flash file without password, android Fastboot FRP reset tool, firmware, flash file, Stock Roms, Combination file, Boot File, Custom Roms.Thanks for using Our Files. stay with us www.Gadgetsdr.com.